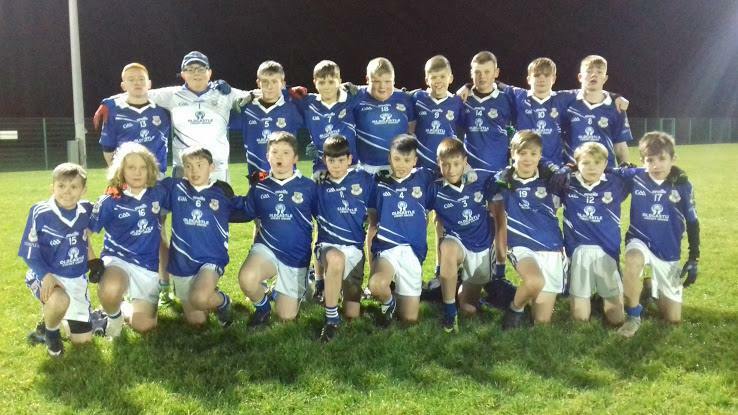 It was a disappointing end to the season for our U-13’s in Dunganny tonight, losing the Autumn League to Donaghmore Ashbourne by a mere two points. Oldcastle started the brighter, and two goals in the first half from Rory Crawley, plus points from Tom Lynch, Eoin Smith, Paul Hennessy and Ciaran Connell left them leading at the break: Oldcastle 2-09, Don/Ash 2-06. Don/Ash took the first score of the second half, with a pointed free. Oldcastle replied with one of their own, the free taken by Rory and tipped nicely into Eoin Smith for the score. The next came from great work by Tom Lynch who kept the ball in possession and on to Alan Gilsenan, back to Tom and in to Ciaran Connell who blasted the ball to the net for a great goal for Oldcastle. With the gap now six points it was looking good, but Don/Ash came back with another pointed free, before blasting in a goal of their own. The momentum had swung behind the opposition, and the next four scores were theirs: when the final whistle blew the score was Oldcastle 3-10, Donaghmore Ashbourne 3-12. However, and as Coiste na nÓg Chairman Ciaran Benville said in his presentation speech, Oldcastle played some seriously good football tonight, and it could have gone either way. This Division 2 league started way back in August, and Oldcastle were rightly top of the league for super football all through. Well done to each and every one of you, and to coaches Ronan Crawley, Andy Sheridan and Barry O’Connell for all your hard work and dedication this year. Enjoy the well-earned break. Well done also to all the Oldcastle supporters who travelled on this cold winter’s evening to support the lads. Oldcastle: Rian Mulvanny, Thomas Sheridan, Alan Gilsenan, Fionn McCabe, Cormac O’Connell (Joint Captain), Pat Crawley, Paul Hennessy (0-03), Rory Crawley (2-01), Tom Lynch (0-01), Eoin Smith (Joint Captain 0-04)), Ryan Halpin, Jamie Keatinge, Ciaran Connell (1-01), James Gibney, Adam Smith, Mark Cadden, Alex Curran, Pauric Brady, Sam Svensson.